You're probably familiar with stress. It can cause headaches, upset stomach, high blood pressure, chest pain, problems sleeping and exacerbate the effects of other illnesses. And the number one cause of stress in our lives? No surprise, it's work. But before you run off to quit your job, citing health concerns, you should know that there are easy things you can do to manage your stress levels at work — with the help of these handy apps. Sitting in a desk chair and staring at a monitor all day do nothing good for your health or your stress levels. Fortunately there's a simple way to combat this problem — remember to take regular breaks. However, we know just how easy it is to get caught up in work and forget, which is why there are apps to remind us. Awareness is an application for Mac and Windows that doesn't force you to take breaks — as with some apps that dim your screen or lock you out of your work when it's break time — but it does offer a non-intrusive reminder of how long you've been working. Awareness shows in your menu bar how long you've been working without a break and will chime hourly reminders to get away from your computer. When you do take that break, no need to tell Awareness — it can tell when your computer is idle and will automatically reset its timer. Staring at a monitor for any period of time, which many of us have to do for work, can be hard on your eyes. But taking regular breaks to do something with your eyes other than looking at a monitor can reduce eyestrain and the associated headaches and other problems you might encounter. Protect Your Vision is a simple website that reminds you to take a break and look away from your monitor regularly, and even recommends some gymnastics for your eyes. Since it's a website, you'll have to keep it open in a browser window for it to work, but it will chime audibly when it's time to take a break — and if you use the Chrome, Firefox and Safari browsers it can also pop up notification messages. StretchClock and Gimmie a Break! If you don't want to install an application on your computer but want a little more control than the Protect Your Vision website offers, Chrome and Firefox users can utilize browser addons to remind them of break time. 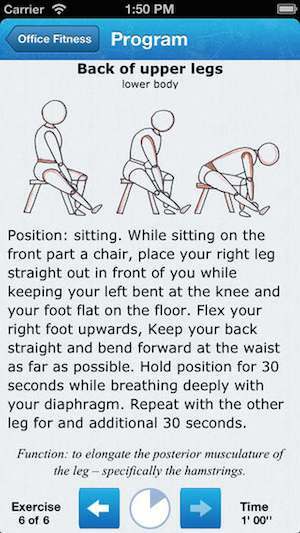 We love StretchClock for Firefox, which not only reminds you to take breaks, but walks you through some stretching exercises to make the most of your down time (though if you want to go get a cup of coffee, that's okay, too). Gimmie a Break! for Chrome is a more straightforward timer, allowing you to schedule when you want to take short and long breaks. Don't like any of these apps? Don't worry: you certainly don't need them. Remind yourself to take breaks with a timer, your favorite reminder app, or just by keeping an eye on the clock. Meditation may sound like a new age fad, but taking a few minutes away from whatever is stressing you out can really help clear your mind and leave you energized for the rest of your work day. If you aren't sure where to start, these apps will help. 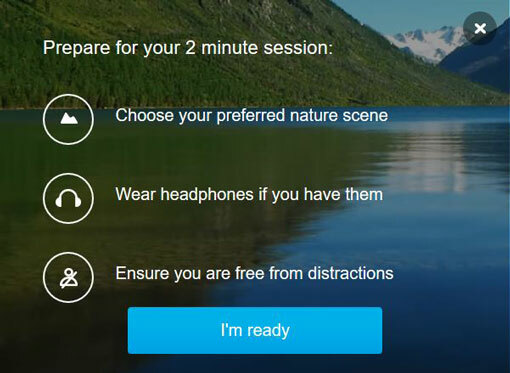 You may have visited Calm.com on the web and been encouraged to take a 2, 5, 10, 15 or 20-minute meditation break, with nature sounds and narration walking you through the process. Their iOS and Android apps offer more of the same, but walks you through more meditation sessions and lets you further customize the length of your relaxation break. While the app itself is free, you'll have to make an in-app purchase to unlock all of the options. The website, however, is entirely free. Though these two apps from Meditation Oasis have slightly different names, they're the iOS and Android (respectively) versions of the same thing. Like Calm.com, Take a Break walks you through a meditation session, either as a short break or to combat stress. Both of these apps are free, though Meditation Oasis offers a number of apps with more meditations for $0.99 each. If you aren't convinced by guided meditations, Relax takes a more straightforward approach, encouraging you to focus on your breathing. It may sound like you're doing nothing, but, trust us, doing nothing but breathing exercises for a few minutes can really calm you down. The app has no voiceover, just a visual and audible indication of when you should inhale and exhale. We love the audible indication, since it means you can use this app with your eyes closed. You can give the app a try by downloading the free Lite version (iOS or Android) or buy the full version — $2.99 for iOS or $2.99 for Android — with additional breathing exercises. Exercise is a great natural stress-buster, so what better way to spend your break than by getting a little exercise? While you could go for a walk around the block or a trip up and down the stairs, there are plenty of ways to exercise right from your desk — these apps will walk you through some. This free app for iOS users offers a customizable exercise program that you can do right from your desk. Just pick the areas you want to work on, pick a time duration and Office Fitness will present the perfect workout. Each exercise is illustrated and thoroughly explained with text. And if you need reminders, Office Fitness will even tell you when it's time to get moving! This app for Android is just what it sounds like, offering you simple yoga poses you can do in your office. And don't worry: even if you've never done yoga before, these stretching exercises are very simple. We love the app's thorough explanations of each pose, with photos, text instructions, audio and video instructions. This is a free workout pack for Daily Yoga - Yoga Fitness App (free in Google Play and iTunes). So you'll need to install Daily Yoga and then select the free Office Yoga to De-Stress pack for iOS or download it for Android devices. Games: We're not suggesting spending hours in a game, but taking a break with a short game isn't a bad idea. Laughter: "Laughter is the best medicine" may sound cliche, but laughter really does help relieve stress. Browse to our picks for the funniest websites or try loading up your smartphone with books, videos, or podcasts that are sure to make you smile. Music: Your favorite tunes are a great way to forget about stress. Be sure your to have your headphones handy and your smartphone loaded with music! Good luck on having a stress-free workday! I would like to nominate GPS for the Soul (GPS4Soul) to the iPhone app list. This is a great app that measures the heart rate to indicate the level of balance and harmony. This is a great app! You should do an article about stress-busters for retail workers. The VAST majority of workers in the US today work in some sort of retail or other service-related job. We spend the entire shift on our feet, lots of times in a particular space with limited movement. There are stretches that can be done behind a counter and mental exercises that can be practiced for when that customer (YOU know who you are!) comes in and treats us as if we don’t exist—or, worse, exist ONLY to serve YOU! Awareness does not have an uninstall! Awareness for Windows does not show up in the list of installed programs in the Control Panel so I could not uninstall, nor did I see a way to turn it off! Fortunately I set a restore point, which didn’t even complete successfully but it appears to have rolled back to a point before Awareness. Nice bell yes, but this is obviously very bad.